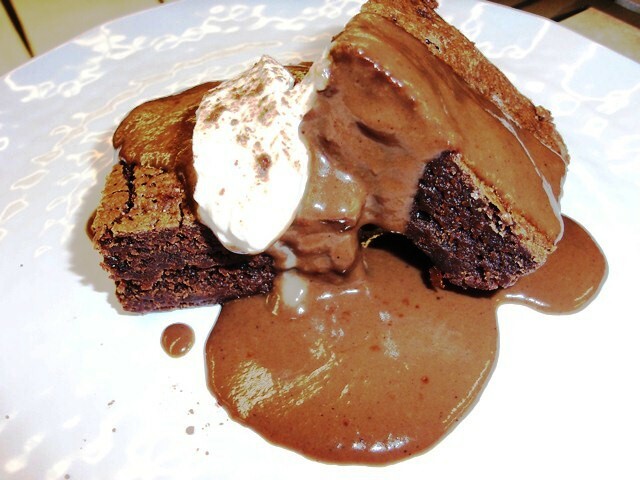 These brownies are moist and delicious and with the warm pudding on top takes it over the top. Make this dessert to spice up the end of your meal or have the girls over with coffee it will be a hit for sure!! In a small sauce pan add all chocolate and butter, whisk together until melted, pour into small bowl, set a side to cool for about 15-25 minutes. In a large bowl add brown sugar and beat in chocolate until well combined, add eggs one at a time , making sure each egg has been fully incorporated before adding the next. Add vanilla, then fold in dry ingredients, just until blended. Bake at 350 degrees for 25-30 minutes in a 9×9 or 11×13 baking pan. In a medium bowl add egg and sugar, whisk together, then add milk, cornstarch, cocoa, salt, cinnamon and espresso powder, whisk until combined. Add mixture to a medium saucepan and cook on medium heat until thick and bubbly, whisking constantly for about 15 minutes. Remove from heat add Iberra or Abuelita chocolate, vanilla and butter, whisk until chocolate has melted and pudding is creamy. Set a side for 15-20 minutes before serving, can set longer to be a room temperature, store extra in an air tight container in the refrigerator, use with in 3 days. **Note – this pudding will not set up, it will be runny, this is because the lack of the amount of cornstarch used. Add some spicy whip cream on top too. Whip 1 pint of heavy whipping cream with 2 tsp. 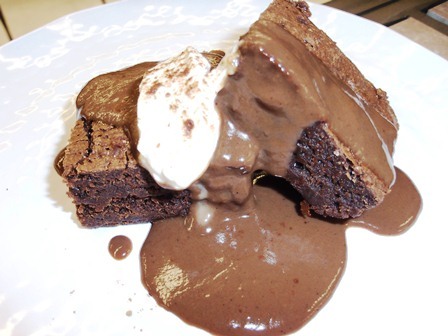 McCormick Cocoa Chile Blend, add a dollop on top of the brownie with that warm pudding…so so good…Enjoy!!!! Happy Cinco de Mayo!!! This recipe is a recipe I came up with for a Cinco de Mayo cooking class I had…Make it tonight for your party!!! Looks so yummy. I love chocolate with cinnamon and with chipotle or cayenne so this is perfect! No time to make it tonight but I did manage to make cinnamon chocolate pudding to pack in the boys’ dinners at the gym before swim lessons tonight!